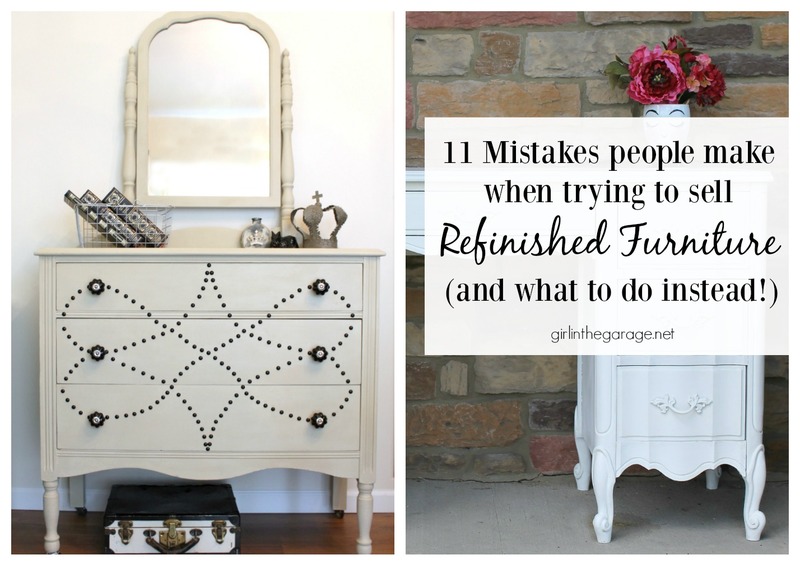 When selling refinished furniture, pricing can be an uncomfortable topic. You want to make a nice profit for all the work you did, but will anyone pay the price you’re considering asking? You debate and end up feeling guilty, so you list it for a lower price than you wanted. And then you get a message – Will you take half price? 1. This should be obvious – but try to buy good quality pieces for as low as possible. 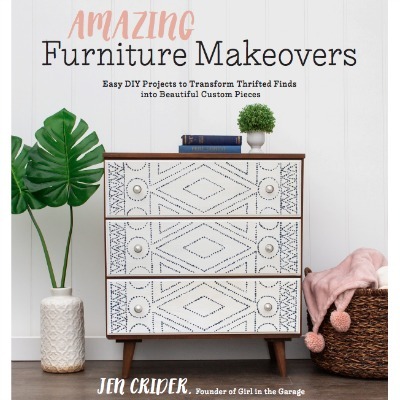 You might find an antique dresser for $20, but if the veneer is peeling off everywhere, it has a strong musty odor, and the drawers are all wonky, it will take up much more of your time and supplies than a $60 dresser that needs no major repair work. Use your best judgement based on your skill level for how big of a project you want to tackle just to save some extra money upfront. To be truthful, I’ve never spent more than $70 on any piece of furniture that I’m going to flip. 2. Keep track of all your supply costs, and try to break it down per project. 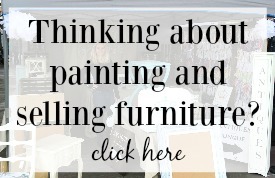 For example – don’t add the full price of a can of paint if you only used half of it on a dresser. Some supplies you’d include here are paint, topcoat, sandpaper, primer, stain, etc. 3. Keep in mind overhead (training/membership fees, marketing/branding expenses, depreciation of equipment/tools, booth rental, storage unit, travel, etc. ), which may be harder to determine per item, but is necessary to factor in a portion of the costs. 4. How much of your time and energy did you spend on it? A 2-hour project may not bring you a higher price like a 2-day project (but then again, it could! It depends on the piece). Painted pieces with a lot of layers and creative finishes often command more money than pieces with just one simple color and topcoat. Figure an hourly wage that makes sense for your time and the effort/energy you spent on the project. 6. 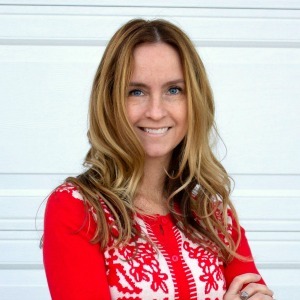 How much does your competition charge (and what are their customers saying about them)? Are your products very similar or better quality? And I do believe that geography plays a role in pricing, unless you’re willing to offer shipping or delivery to other areas. 7. How much are you comfortable charging? If you price too low, you may be undervaluing your worth and giving the impression that your work is lesser quality. If you price too high, you may scare some people away at first, but they might not be the target market you’re trying to reach anyway. It’s easier to lower prices later if your pieces aren’t selling fast enough than to raise them if you get too much interest quickly and regret the low price. The trick is to test different prices until you’re happy, your revenue is higher than your expenses, and your customers are satisfied. 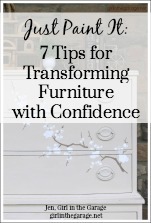 In the end, if your competitors are all charging way more or way less when selling refinished furniture, you need to be comfortable (and confident!) 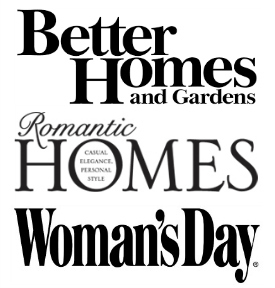 with your own prices while still running a profitable business. Refinished Furniture Bought/Sold Examples: Watch the video below for pricing examples of thrifted pieces I’ve bought, fixed up, and then sold. 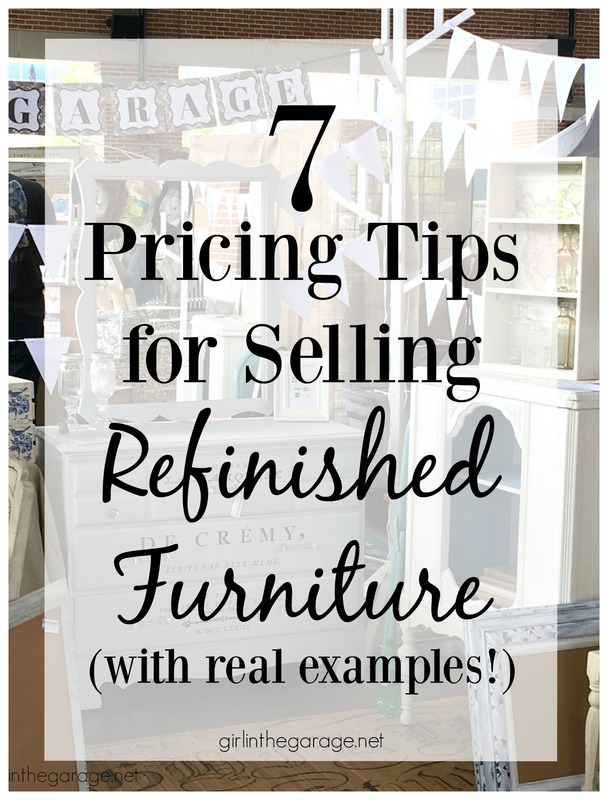 Great information but did I miss where you listed the prices of the items you refinished? Thanks Robin! I listed some examples with prices in the video above… how much I paid for a piece, what I spent on supplies, and how much it sold for. Thanks for the info. I’m thinking of getting some pieces ready to sell at a flea market. I’m going to check it out this weekend to see what people sell and prices (like you said). This gives me some guidelines. I’m going to check out your mistakes post. I think I already read it, but a refresher is always good.